VéloCity Bicycle Co-op is taking the tools to the community with our Mobile Repair Shop. See us at the Four Mile Run Farmers and Artisans Market (see map) bi-weekly through the end of October. 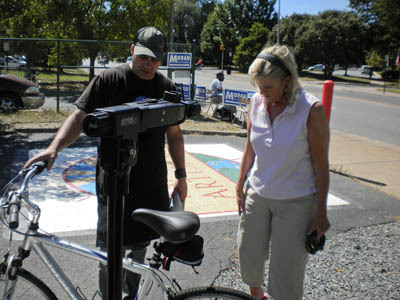 Bring your bike, because we have tools and repair stands available for on-site bicycle maintenance and advice. (It’s a great ride — right off the Four Mile Run trail.) Why you’re there, enjoy the food and wares provided by local vendors. See us there on September 5, September 19, October 3, October 17, and October 31 from 8 AM – 1 PM. Hello! Is this the community co-op that works with children to show them how to maintain or fix their bicycles? Hoping that is the case as i have a 10 and 12 year old that recently discovered how much fun it is to take the cobwebs off their bikes and go riding together. I had read about it in a local paper. @Kathie: That’s us! Bring your kids and their bikes by the shop, and we can help them dive in. Of course, we help adults with their bikes too. P.S. Do you remember what paper you read about us in?